Form 26AS is an annual consolidated tax statement that can access from the official website of Income Tax. This form is accessed by all the taxpayers using their Permanent Account Number. If you have paid the tax from your income or if the tax is deducted from your income then all the information is stored in the Income Tax Department Database. Details of the tax deducted from your income by the Deductors. Details of the tax collected by the collectors. Details of the refund received by you during the financial year. Details of the High valued transactions in respect of shares, mutual funds etc. Via Net Banking Facility of the Authorized banks. 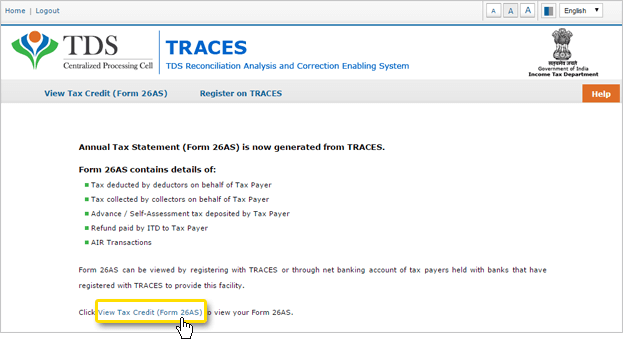 TRACES is known as TDS Reconciliation Analysis and Correction Enabling System. This is one of the products of the Income Tax Department. 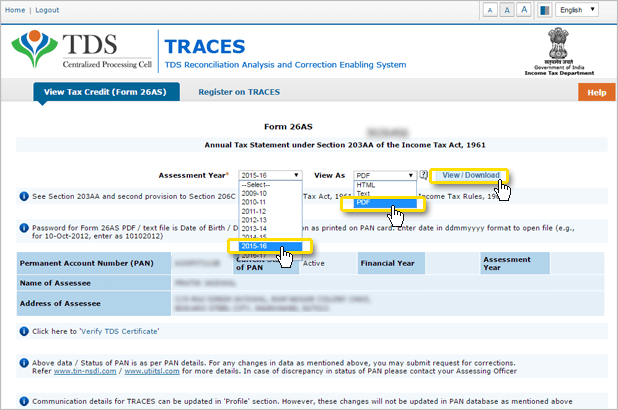 This main objective of the TRACES website is that it allows online correction for already filed TDS Returns. It is a hassle-free system. The PAN Card and Challan corrections can be made using the online rectification. Registration: For downloading the Form 26AS, the tax Deductor needs to get registered himself/herself on the official website of the Income Tax Department. The official link to the Income Tax website is incometaxindiaefiling.gov.in. Once the registration is completed, a login id and a password are allotted. Now the tax Deductor has to login using these credentials. Login:Enter the PAN Number, password, and date of birth/ date of incorporation in DD/M/YYYY Format. Also, enter the captcha code that is provided in the box. Now click to login. Go to “My Account” and click on the “View Form 26AS” in the drop-down menu. Click on the “Confirm” button so that you are redirected to the “TRACES” website. Now when you reach the “TRACES” website, select the box on the screen and click on “Proceed”. Now click the link present at the bottom of the page- “Click View Tax Credit (Form 26AS) “to view your Form 26AS. Choose the Assessment Year and the type of Format you want to view the Form 26AS. Like for example, if you want to view the Form online, then leave the format in HTML. If you want the form in PDF Format then you can download the form in PDF format so that you can save it for the future reference. After you are done with the Format selection, enter the “Verification Code” and click on the View/Download. Viewing the Form 26AS is completely Password protected which means to open the document you need to enter a Password. Form 26AS password is your Date of Birth- DDMMYYYY format. And after entering the password you can view the Form 26AS. This facility is available to the PAN Holders who are having a net banking account with any of the authorized banks. You can view the Form 26 AS (Tax Credit Statement), only when your PAN Card is linked to the respected net banking account. This has the details of the taxes deducted from your salary, interest income, pension income and prize winnings etc. The TAN of the Deductor and the amount of the TDS deducted and TDS deposited is also mentioned. This information is provided on the quarterly basis. This provides the details of the income where no TDS is deducted, as the taxpayer has already submitted the Form 15G/ Form 15H. You can also verify the status of the TDS deduction if you have submitted the Form 15G/ Form 15H. If you haven’t submitted the form then it will display “No transactions present”. If in case you have sold any property during the year then and the TDS is deducted from your receipts then you will find the related entries in there. This has the details of the tax collected at the source by the seller of the goods. The entries are present here if you are a seller and the tax is collected by you. If you have deposited any tax by yourself then that information will be displayed here. Details of the advanced tax and assessment tax are also present here. It also contains the details of the Challan through which the tax is deposited. This section contains the information that you have received your refund. It also displays the related assessment year to which the refund pertains, along with the mode of the payment, an amount paid and interest paid along with the date of the payment. This section mainly contains the high-value transaction records. Banks and other financial institutions are also required to report high-value transactions to the tax authorities. It also includes the mutual fund purchases of higher values, property purchases, and high-value corporate funds. If you have bought a property and you have to deduct the TDS before making the payment to the seller. 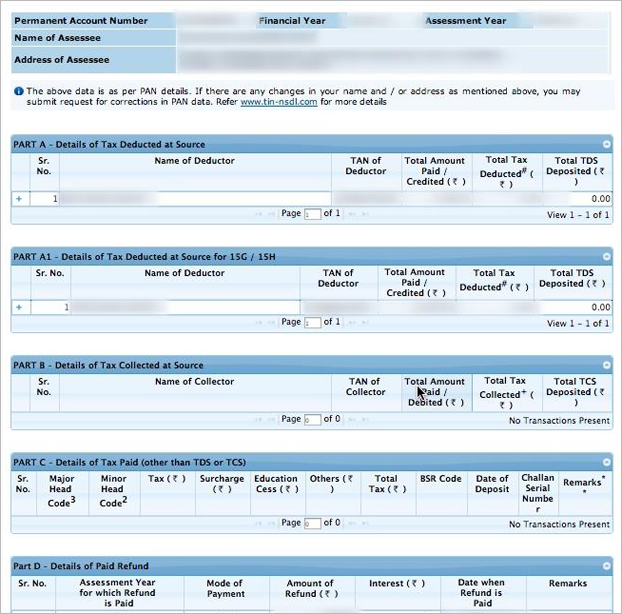 This section contains the details of the TDS deducted and TDS deposited by you. This section includes the defaults related to the processing of the statements and it does not include any demand raised by the assessing officer. A Taxpayer can also avail the facility of the online correction of TDS Challan by registering himself on the TRACES website. Apart from PAN and Challan Corrections, all the other corrections will be made through the offline mode through TIN-FC. Income Tax has always been making a strong and a convincing impact on the economy of the country. It is a boon and a key driver for the growth and development for any country. The Income Tax Department also manages the whole database of the Total tax paid by the employer/tax payer. This procedure of filing an income tax is called as “ITR Filing”. Well, while filing for an ITR there are various forms and documents that are needed to be submitted. One of such form is the 26AS Form. The income tax provides sufficient facilities and benefits to the citizens of the country. Also, if there is no income tax in the country then it will be very difficult to collect funds and organize and maintain the systems like the Military System, Industry, Agriculture, Police etc which are the backbones of the society and country’s economic growth. Like for an example, it would be impossible to survive and stay safe without the Police Department. The Police department protects the society and provides us security. The army pack of the country also protects the country from the enemies from the terror attacks and crimes. Thus, in order to have a smooth functioning of all the systems the income tax is posted on all the citizens of the country all over the World. Law Enforcement and Public Order. Energy, Waste and Drainage and Transportation System etc. Form 26AS contains various details that were deducted from your income when you need to file an Income Tax Return. This is one of the important document that is required while you are filing for an ITR. Form 26AS is an annual statement which holds the details of the Tax Credit which are maintained for each tax payer as per the Database record of the Income Tax Department. The Form 26AS is issued under the section 203 AA of the Income Tax Act 1961. The form contains various details of the taxes deducted from your income by the deductors. The deductors can be your employer, bank or a tenant. The Form encloses the details of the advance taxes, self-assessment tax that you may have paid during the year. Besides that, it also contains the details of the tax collected at source (TCS) which is also mentioned in the statement. It will also state the details of any income tax refund received from the tax department during the relevant financial year. It will also reflect the annual details i.e, the Annual Information Return which is filed based on the different entities, on what the individual has spent or invested into. It mostly focuses on the high-valued transactions. Consider an example, if a person deposits cash in his/her savings account and the amount exceeds 10 Lacs then, the bank will send an AIR. The same goes for, if more than Rs 2 Lacs is invested in the Mutual Fund or if more than 2 Lacs is spent on the credit card. The details of the taxes in the statement are sent by the deductors and the sellers after the confirmation of the Banks that the taxes have been received. Every tax payer has been advised to double check his Form 26AS to confirm that the taxes deducted and the advance tax paid during the year matches the tax deposited as per the Income Tax Department records. Any error in the Form can lead to the tax authority issuing the notice. This mismatch can occur due to the wrong entry of PAN Card details, Aadhaar Card Details, Assessment Year records. 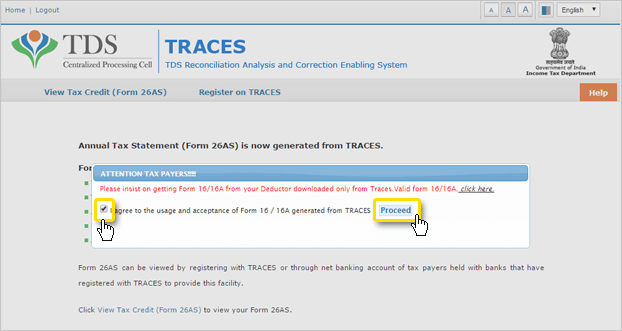 TRACES Website– The TRACES website works under the Income Tax Department which denotes- “TDS Reconciliation Analysis and Correction Enabling System”. Via Netbanking Facilities provided by certain Banks. Log in using your Income Tax Department User ID and password. You need to register yourself first to receive the User ID and Password. Enter the User details, which include User Id, password, date of birth in DD/MM/YYYY Format. Enter the Captcha and Log in. A screen appears, which directs to “Go To My Account”. When clicking the My Account option a number of sub-section appears. Click on “View Form 26AS” in the drop-down. After clicking, you are redirected to the TRACES Website. A box appears on the screen, on the TRACES Website. Click on the box and proceed. A link appears at the bottom of the page, “Click View Tax Credit (Form 26AS). To view the form. Choose the assessment year and the format in which you want to view the Form 26 AS. If you want to view the form online then leave it in HTML format. If you want to download it, choose the PDF Format. After choosing the desirable format to enter the “Verification Code” and click on the View/ Download. To open the document you have to enter the Password. The password of Form 26AS is your Date of Birth in DD/MM/YY Format. Thus, you have successfully downloaded the 26AS Form. This facility is available to the PAN Card holder who has Net Banking Facility. If your PAN number is mapped to the particular account then the facility is available for free. The Following Banks are officially authorized banks to facilitate Form 26AS. PART A1- Details of the tax deducted at the source for Form 15 G/ Form 15 H.
PART A2- Details of the tax deducted at source on sale of Immovable Property u/s 194 (IA) For the seller of the property. PART B- Details of the tax collected at the source. This Part of the form contains the details of the TDS deducted from your salary, interest income, pension income and prize winnings etc. The TAN of the deductor and the TDS deducted and deposited are also mentioned. Here the information is based on quarterly. Here the details of the income are mentioned where no TDS has been deducted. It is because you have applied for Form 15G and Form 15H. You can verify the status of TDS deduction if you have already submitted the 15G and H Form. If you have not submitted the form then it will show “No more Transactions”. This part contains the information if you have sold your property and the TDS was deducted from the receipts. Then you can find the required relevant information here. This part contains the details of the tax collected at the Source by the seller of goods. You can view the entries if you are a seller and the tax is collected by you. If you have deposited any tax by yourself then the related information can be found here. The details of the tax paid, self- assessment tax is present here. It also contains the details of the challan through which the tax is deposited. if you have received a refund then you can find out the details in here. Assessment of the year when the refund is applied. Along with the mode of payment, an amount paid and interest paid and also the date of the payment is mentioned. Here the high valued transactions to the tax authorities are reported by the Banks and other financial corporations. Mutual fund purchases of high value, Property purchases, and high-value corporate bonds are also reported here. If you have purchased any property then you have to get your TDS deducted before making payment to the seller. This part contains the information regarding the TDS deducted and deposited by you. This contains the information regarding the defaults related to the processing of the statements and do not include the demand raised by the assessing officer. The TDS Mismatch in the form 26AS is one of the common problems that is faced by some of the tax payers. The TDS mismatch is mainly the mismatch in between the records of TDS and the records uploaded in the form 26AS. After the deduction of the TDS/TCS, the person who is deducting the TDS amount should deposit the same with the income tax department. Some of the possible reasons for the Mismatch of the TDS in Form 26AS is- Wrong input of PAN number or TAN number, Payment of TDS, Challan Identification number etc, the Wrong amount being mentioned in the TDS. To avoid such problems always match and compare the details between the TDS inputs and the inputs in Form 26AS. Otherwise, intimate the person who has deducted the TDS. He will later file a Revised TDS return with the correct particulars that will later be visible in the Form 26AS. NOTE- The person who has deducted the TDS to file the Revised TDS takes time to make changes. The income tax website does not get updated instantly. It takes time for the Form 26AS to get updates as well. This form serves a lot of purposes. Besides cross-checking the data it is also used for ITR filing purpose. 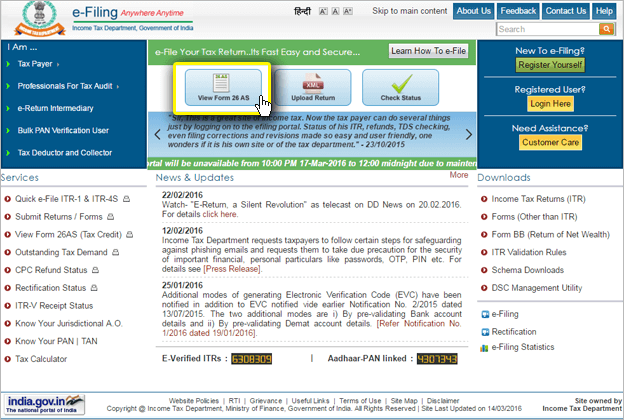 You can visit this link to know the procedure to fill ITR offline: Filing ITR Offline step by step procedure.